Cayo's show record speaks for this incredible male! Not only is Cayo a Champion himself, he is a producer of Champions in many colors; including El Galan, La Palomita, Tita and our very own, Starshire's Antares! 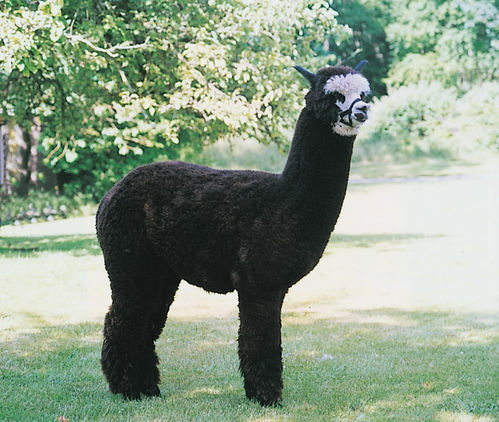 In 2007 Nishio was awarded the All-American Reserve Herdsire of the Year, in 2004 the All-American Herdsire of the Year, and in 2005 was the AOBA Get-of-Sire winner. Nishio has an exquisite fleece, which is black in color, extremely dense and full of high frequency crimp. Nishio's offspring have incredible fleeces and their achievements in the showring are impressive. 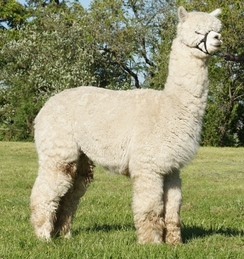 Most remarkable are FULL CHILEAN, Patagonia's Vinci, a white male who won first place at most of the major shows of 2004 (including, IAO, NAAS, AFF, GWAS) and FULL CHILEAN, Patagonia's White Rose, a white female who won the RESERVE CHAMPIONSHIP at the 2006 International Alpaca Odyssey judged by Julio Sumar, Charlene Freidman and Val Fullerlove, THE RESERVE COLOR CHAMPION at the 2006 Alpacapalooza judged by Charlene Freidman and the COLOR CHAMPION at the 2006 AWE where is was judged by Mike Safely; and FULL CHILEAN, Patagonia's Solstice who was the SUPREME CHAMPION at the International Odyssey 2006. 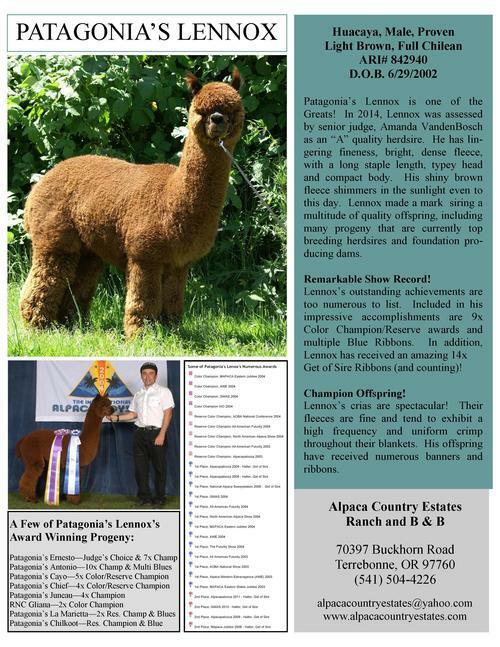 Patagonia's Sunburst has powerhouse genetics of her multi-champion sire Patagonia's Cayo, legendary grandsires Patagonia's Lennox and Nishio, and great-grandsires Danko and El Padre. On 9/5/2016, Sunburst had ESTATES SOLAR ECLIPSE, a lovely bay black female cria sired by our modern dark silver grey, Morning Star’s Don Diego. At 62.8, Morning Star’s Don Diego is the third densest grey animal ever tested and at 8 years old, Diego’s AFD was 21.3; CF 95.7 and sheared 8+ lbs. as tested by Ian Watt.